You have to pass the CLSSGB exam to receive the certification from GAQM. To increase the effectiveness of your study and make you familiar with the actual exam pattern, we have prepared this sample questions. 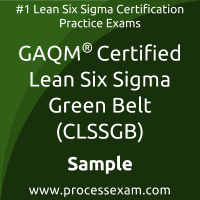 Our Sample GAQM Certified Lean Six Sigma Green Belt Practice Exam will give you more insight about both the type and the difficulty level of the questions on the GAQM CLSSGB exam. However, we are strongly recommending practice with our Premium GAQM Certified Lean Six Sigma Green Belt Practice Exam to achieve the best score in your actual GAQM CLSSGB Exam. The premium practice exam questions are more comprehensive, exam oriented, scenario-based and exact match of GAQM Certified Lean Six Sigma Green Belt exam questions. 01. After a Belt has put data through the smoothing process which chart would be used to look for trends in the data? 02. As a standard for a process to be at the 6 Sigma quality level, it must have? 03. A kurtosis of -1,2754 indicates? 04. Which statement(s) are true about the Fitted Line Plot shown here? a) When Reactant increases, the Energy Consumed increases. b) The slope of the equation is a positive 130.5.
c) The predicted output Y is close to -18 when the Reactant level is set to 6.
d) Over 85 % of the variation of the Energy Consumed is explained by the Reactant via this Linear Regression. 05. A two-sample T-test does which of the following? 06. As we calibrate our Measurement System to assure accurate data we frequently encounter Bias which is the __________________ of a measured value from the ________________ value. 07. To draw inferences about a sample population being studied by modeling patterns of data in a way that accounts for randomness and uncertainty in the observations is known as ____________________. 08. All of the following are benefits of control plans except? 09. When analyzing a data set we frequently graph one metric as a function of another. If the slope of the Correlation line is -2.5 we would say the two metrics are ___________ correlated? 10. If a Histogram displays two peaks the distribution would likely be _____________.